A groundbreaking new study reveals a link between visual problems and early stages of Parkinson's disease (PD). This study could help doctors discover new biomarkers to help them diagnose this debilitating disease earlier than ever before. 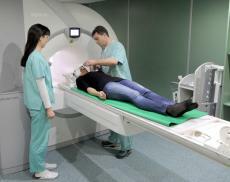 Researchers in Italy took a look at 20 MRI scans from people recently diagnosed with PD. The doctors also used a great deal of health controls to keep this study as objective as possible. As they looked over the images, professors noticed many abnormalities in the visual systems of these patients' brains. In particular, researchers saw less brain matter where the right and left optic nerves cross. Also, the geniculocalcarine tracts in PD patients' brains were significantly altered. Alessandro Arrigo, the study's head author, said this study proves that PD adversely affects the intracranial visual system well before the disease is officially diagnosed. Dr. Arrigo, who teaches at Università degli Studi di Messina Messina, said this study challenges the current hypothesis that PD only affects a patient's retina. As Dr. Arrigo put it, "Our study was able to describe novel findings regarding an extended involvement of all visual system components." Dr. Arrigo hopes this study will improve PD patients' lives by encouraging doctors to check for "visual symptomatology" as soon as possible. In some cases, Dr. Arrigo believes visual symptomatology of PD could occur a whole decade before motor symptoms emerge. As with many other diseases, early diagnosis of PD can vastly improve a person's quality of life. Although PD can't be "treated," doctors can manage symptoms far better before the disease progresses. PD is a disorder that affects a person's central nervous system. A few symptoms PD sufferers face each day include bodily tremors, stiff muscles, difficulty balancing, and impaired speech. The most common treatments for this disorder include dopamine promoters, anti-tremor medications, and physical therapy. About 1 in 500 UK residents suffer PD. That translates to around 127,000 patients. Although many people start experiencing symptoms over the age of 50, 1 in 20 people notice the warning signs of PD when they're in their 40s. Anyone living with PD in the UK should contact the group Parkinson's UK for information and support. UK residents can call this group's hotline at 0808 800 0303. People interested in reading the full Italian study can find it in the latest copy of the medical journal Radiology. This study was published under the title "Visual System Involvement in Patients with Newly Diagnosed Parkinson Disease."